It is fascinating to me as a writer and teacher the amazing power of words. Words are the baskets that we carry our self-worth in, the envelope for our soul, the material we construct metaphors from to understand the entire world. One of the projects I have been working on with my students, is a map of your life, or emotional landscape. By even sitting down and drawing symbols, it is interesting how much we show by simple lines, color, movement, words, and placement on the page. Here is a map I made of my perceived worldview–my themes always seem to center around what can be known/what can not be known. Thursday, May 17, 2012 — You need to reinvent your life now by remembering your personal history and retelling your story from a fresh perspective. Creating a new framework for the past enables you to envision radically different possibilities for the future. Nevertheless, your desire to break free from your present circumstances might stress you out because of the lack of security. Don’t worry if you need additional time to get everything in order before you make your move. It’s helpful to look back; just remember to also look ahead. Basically, the way that we understand ourselves and the way that we understand the world is ontological. Ontology is the study of the nature of reality, or existence. Since language constructs reality (shorthand for the Sapir-Whorf hypothesis), by defining the words we use to name our feelings, our hopes, dreams, grief and fear helps to make the framework of our mind—our worldview–more conscious. 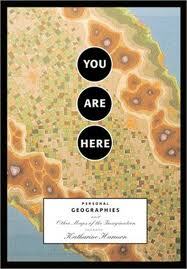 The best book I have read that shows the creative reach of the map, is You Are Here: Personal geographies and maps of the imagination Edited by Katherine Harmon. I highly recommend this book for endless amounts of inspiration! Erin Jourdan is a writer and teacher living in Los Angeles. She helps people learn more about themselves using writing.